In this darkness of the world, where is it that we can get light from? Light - what does it mean? What does it denote? When we're in a dark space, we do not know where to go, we have no path to walk upon, the light is what shows us the path. In the darkness of this world, we don't know which way to turn, Sathiguru Maharaj Sahib Jee says there is a Light which will give you guidance. We ask Maharaj , what's that Light? Sathigur sabadh - The True Guru's, The Perfect Guru's, Sri Guru Granth Sahib Jee Maharaj's sabadh, the Word of The True Guru, the bani of The True Guru, the mantra of The True Guru, that is oujaaro - that is the Light that is burning within, dheepaa - meaning the lamp. That is the lamp, that is the Light which is burning within. What does this Light do? Thih ma(n)dhar - ma(n)dhar means building, which building are we talking about? We're talking about the body. Within this body, within this physical and spiritual body, there has been a darkness. A(n)dhhakaar - there is the darkness of spiritual ignorance. Maharaj Jee says that by lighting the lamp of The Guru's shabad, what does it mean to light The Guru's shabad? To have it ignited within you? That you are following The Guru's shabad, using The Guru's shabad to light up your way, just like you use a torch to light up your path, at each point, turning to The Guru's shabad for guidance and understanding. Maharaj Jee says Sathigur sabadh oujaaro dheepaa - from the day that I began to use The Guru's shabad to enlighten my life, from the day that I took the support of The Guru's shabad, the a(n)dhhakaar, the darkness from within me, from within this body, this ma(n)dhar has all been removed. What have I found? Rathan kot(h)arree. I have found a kot(h)arree - a chamber full of rathan, full of diamonds. What chamber is that? The chamber of true devotion, of true bhagti, and within this bhagti, within this chamber of devotion, I have found the rathan, the diamond of The Guru, the diamond of The Lord's Name which is within me. Khulhee anoopaa, this anoopaa, this indescribably beautiful chamber has been opened because I now have the Light of The Guru's shabad to open up this chamber within me. Rehaao - Guru Jee says pause and think about this. When I paekhiou - when I looked inside this chamber within me, inside my spiritual body, Guru Sahib Jee says bisaman bisam bheae jo paekhiou, jo means when, bisaman bisam means to go into a deep state of awe and wonder and amaezement. I was amazed, I was astonished, it was an indescribable experience. Bisaman bisam means in another understanding that when my mind turned away from bikheya means poison, when my mind turned away from the poison's of the world, when I looked inside this chamber of devotion, my mind turned away from all the poison's of the world. What are the poisons of the world? Being attached in the entrapment of attachment, being entrapped by desires, hatred, ego all these things. My mind turned away from all of these poisons. I cannot kehan, I cannot describe, I cannot say the vaddiaaee, the greatness of that Naam that I found within myself, The Name of The Lord. Magan means to be completely intoxicated, to be completely enraptured by, oohaa sa(n)g, with that diamond of The Name, in the company, in the sa(n)g of the diamond of That Name, maathae - I became completely enraptured with it, completely embedded it within myself. Outh poth meaning father and son, like a father and son embrace, fall together completely. This is something to understand. The picture that Guru Jee is drawing here, just like a father and son fall to perfectly embrace, lapattaaee, and they are wrapped around each other just like a mother and her child, in the same way I have been wrapped around this Name of The Lord. It has wrapped it's arms around me, looking after me at all times. No jaal, no entanglement of aal, of this world has remained. Aal also means attachment to relatives. I have no more attachment to relations of this world. That doesn't mean to leave, that means to realise that all are going one day, and that all of this is a gift from Akaal Purakh, from Waheguru. No jaal, no entrapment of worldly desires is around me, nehee kashhoo ja(n)jaaraa, kashhoo means any type of ja(n)jaaraa, any type of ensnarement, I've been freed. Aha(n)budhh nehee bhoraa, bhoraa means even a little bit. There isn't even a little bit of aha(n)budhh, of ego left within because The Guru's shabad eradicates all darkness. You know when you light that torch, it doesn;t just take away a little bit of darkness, when you turn on that light in a room, all of the darkness leaves from that room. In the same way if we turn on the light of The Guru's shabad within our heart, mind and soul, all of the darkness will go, there won't be any left. 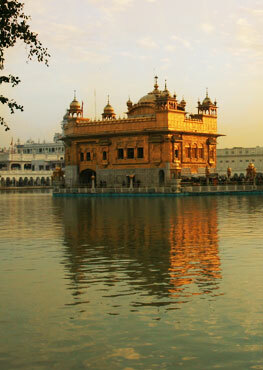 Waheguru is oochaa, higher than oochan, the highest. Beech n kheechaa, and now in between us, n kheechaa, there no longer remains this curtain, this veil that Guru Nanak Dev Jee talks about in Jap Jee Sahib - kiv koorrai thuttai paal, the paal, the wall of falsehood which separates us from The Lord has been taken down. Because the ego has been removed, the desires have been removed. In this state of union, ho thaeraa, Waheguru Jee, I belong to You, thoo(n) moraa - You are mine, we are one at that point. When I realise that we are one, what do I say? Eaeka(n)kaar - there is one eternal creator, pervading through all, He is the same One light Who is pervading through the whole paasaaraa - the whole creation, eaeki apar apaaraa - there is one Akaal Purakh Who is apar apaaraa, unlimited, beyond all limits, beyond all ends. There is one Waheguru Who is bisathheeran - means to permeate, to pervade through the whole universe. Eaek sa(n)pooran - That one Waheguru is completely sa(n)pooran, is completely perfect, and That Waheguru is the adhhaaraa - is the support of my praan, of my breath of life. That Waheguru is the most niramal, the most immaculate, the most pure, the most soochaa, Maharaj Sahib Jee says soocho soochaa soocho soochaa, again and again, that He is the purest of the pure. What does this mean? Being the immaculate Guru, He gave me the immaculate Name of The Lord. What did The Name of The Lord do? It makes us soochaa, and it took away the impurities of my mind, my body, and soocho my soul. It completely purified me. My mind, my bani - my words, and my sharer - my body, all three of these were purified, and I have become soochaa, I have become pure.The niramal immaculate True Lord gave me The immaculate True Name, niramal again, the second niramal. The first soochaa, The Name of The Lord is soochaa, forever purifying, and it made my mind soocho, my man. It made my bani, my words soochaa, and it made my body, physical and spiritual soocho, completely pure. It purified me internally and externally and because of that I have become soochaa. jeeahu niramal baaharahu niramal, Sri Guru Amar Das jee talks about in Anand Sahib Jee, internally and externally purified. Guru Sahib Jee says there is no limitation to Guru, a(n)th n a(n)thaa sadhaa baea(n)thaa, Waheguru Jee is infinite, sadhaa, forever. Kahu naanak, Sathiguru Arjun Dev Jee says oocho oochaa, that Waheguru Jee is the highest of the high. Maharaj Sahib Jee is telling us, if we turn on that Light of The Guru's Word in our lives, not even a tiny bit of darkness will remain.